Large reverse osmosis units provide top quality water for a wide range of uses in residential homes and small businesses. They can be used for drinking water or anywhere pure water is preferred: greenhouses, spot-free car washes, aquariums and fish ponds, window washing businesses, solar panel cleaning, coolers, humidifiers, small water vending enterprises, and much more. The Axeon L1-300 is a compact but powerful reverse osmosis unit capable of putting out a dozen gallons per hour of top quality water. It's great for large homes with high water demand, to furnish not only drinking and cooking water, but multiple refrigerators, ice machines, etc. It's also ideal for small businesses, making enough water to service a modest kitchen or lounge area. 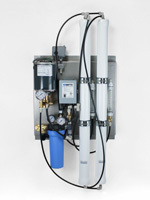 High production “whole house” reverse osmosis units from Watts. 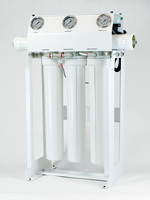 These large, point-of-entry reverse osmosis units are typically used to treat water with high salt content or other difficult-to-treat contaminants.